GLEN JEAN, W.Va. (CNS) — Scouting develops generosity, service and fraternity, which are all values “our world sorely needs,” the papal nuncio told Catholic Scouts gathered for a July 23 Mass during the annual Boy Scouts of America National Jamboree. The archbishop was the principal celebrant of the outdoor Mass celebrated in Glen Jean at the Summit Betchel Reserve in the New River Gorge area of West Virginia. 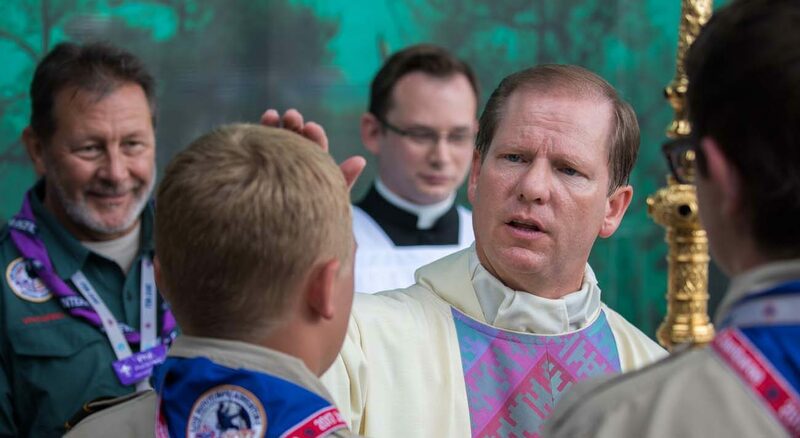 The July 19-28 jamboree drew 25,000 Scouts and troop leaders from around the country; about 7,500 attended the Mass. Concelebrants included two officials of the U.S. Archdiocese for the Military Services, both of whom are Eagle Scouts: Msgr. John J.M. Foster, vicar general and moderator of the curia, and Auxiliary Bishop F. Richard Spencer, episcopal vicar for Europe and Asia. More than a dozen priests also concelebrated. The French-born archbishop recalled his own years as a Scout and how Scouting has benefited members of his family. With God, “our lives are filled with joy, blessing, and fruitfulness,” he said. “Before we can make known to others this joyful message of the kingdom, we must first attend to the ‘field’ of our hearts,” he said, urging them also to be vigilant in safeguarding “the seed of faith and the power of the Holy Spirit” sown within each of them. “Jesus reminds us of the need to be vigilant — to stay awake, to be vigilant and keep watch, to be ready to preserve the grace we first received in baptism,” Archbishop Pierre continued. “Scouts know about staying awake and keeping vigil by the camp fire; about being ready and alert; about watching for danger. We need to do the same with our souls, guarding them from the enemy. “Scouts cultivates in young people a real spirit of adventure, a zeal for exploration and for mission. The Lord is counting on you,” he added.